Present a cooking class/demo at your home or business. Choose from a 2 hr full demo or a "Lunch and Learn". We do the shopping, cooking, and clean up. Class tailored to the audience and interests. Call 941-320-8163 or email for pricing information. Personalized nutrition and health education to help you develop an individualized successful wellness plan. Support and coaching to empower you to succeed. Remote sessions available via Skype and FaceTime. We promote a whole food plant-based program without the use of stimulants or supplements. Choose from a comprehensive wellness plan (monthly fee) or independent education sessions (hourly rate). Stop dieting and start eating to live! Our staff has lectured and participated as a panelists in many events including: Tampa Bay Veg Fest, Puerto Rico Vegan Fest, Food Forward, 1st Annual Charlotte County Plant Based Nutrition Health Conference, Plant-Based Prevention of Disease Conference and more. Contact us to customize a presentation for your audience and requirements. A nationwide research based nutrition education program brought to you by the Physicians Committee for Responsible Medicine (PCRM) since 2001. The Complete Health Improvement Program (CHIP) -- is an affordable, lifestyle enrichment program designed to reduce disease risk factors through the adoption of better health habits and appropriate lifestyle modifications. The goal is to lower blood cholesterol, hypertension, and blood sugar levels and reduce excess weight. This is done by improving dietary choices, enhancing daily exercise, increasing support systems and decreasing stress, thus aiding in preventing and reversing disease. Health screen results are provided to each participant early in the program, and participants are encouraged to share their results and work closely with their personal physician regarding their need for medication as they modify their lifestyle. Immediately following the program, the health screen is conducted again, and a detailed report is prepared for each participant that compares their risk factor levels before and after going through the program. Reports and course completion certificates are presented at the end of the program. See more details in the Program Outline. "I have often told audiences around the United States that the CHIP program is the premier community-based health program in the country!" 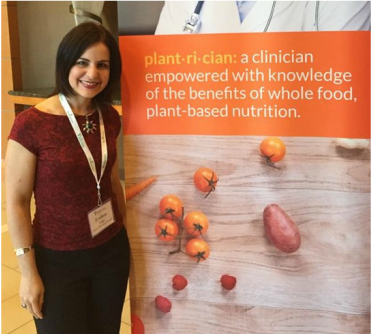 Evelisse is one of the instructors at the T. Colin Campbell Center for Nutrition Studies Plant-Based Nutrition Certificate Program. ​Come join our next class!